Here, the BugE frame sits right side up on saw horses. The BugE was shipped with some cushion material that was just right for stapling to the wooden sawhorses so the paint doesn't get ruined when the BugE is on them. Here, you see the grey material stapled to the sawhorses. The BugE has the rear sawhorse supporting the back and the front saw horse supporting the front. Moving the front sawhorse to this angle allows clearance so the battery tray can be dropped in to have a fender pan fitted to it. 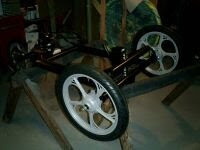 The rear wheel has been installed and the chain fitted to the motor. The car is getting a bit heavy but I can still lift he frame onto the sawhorses one side at a time. It will soon be time to move the BugE to lower jack stands to work on it further. For now, it's nice and high so it can be easily worked on. 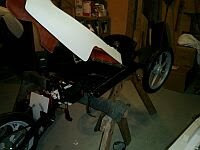 Here are some images that show how the battery tray and rear fender were attached to each other. First, some aluminum piano hinge was fitted to the front of the fender of the BugE using 8-32 screws. I decided to use those screws rather than rivets in case the top needs to be removed at a future time. The holes were drilled, then screws & nuts installed to make sure the hinge fit well & was centered. Then the orientation of the hinge was marked with a magic marker & taken off. Then, the other side of the hinge was mounted to the battery tray, centered, then screws were installed. 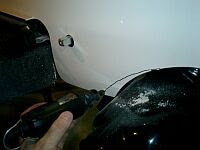 Then, an assistant held up the rear of the fender so the hinge could be re-attached to the rear fender using the screws and nuts that were fitted earlier. To the right, the image shows the attached rear fender held up by a garage rafter as it's being worked on. Next to the rear bumper-shock hump, a single 48V charger has been mounted with zip ties. However, this charger may move to the front with another parallel 48V unit if charging time is found to be too long. Back to the rear bumper-shock hump. A reversing switch has been placed on the left. To get the switch to stand on it's side, some inexpensive "L" brackets were added. The brackets will eventually attach to the white support board using 4 - (1/4-20) - 3/4" bolts. The rectangular metal shaft on the left is for the reversing knob that will stick through a side hole in the fender. Since we now have a fender attached via hinge, we can lower it to take some measurements, then drill the hole. There are several ways to measure where the hole for the switch control should pass through. At this point, the switch is not attached to the board. That way, if the horizontal measurement is slightly off, I can move the switch to meet it. However, the vertical measurement is critical. 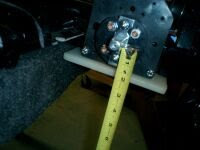 It was found by measuring the distance from the shaft to the bottom of the board plus the distance from the bottom of the board to the lip of the fender when it's lowered. The side hole can then be marked, then drilled using a hole saw. The photo on the right shows that the the fender was still rather close to the motor cover when it was put down so additional body material was removed using the Dremel. Note, you may want to secure the battery tray first and fit the rear fender knob to the rear shock hump BEFORE drilling this hole for the reversing switch. 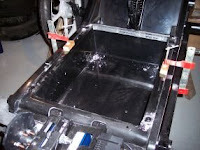 In the image to the left, the fender is lifted off of the battery tray so a small square can be cut out where the emergency brake assembly can be attached. The large white thing is the fender in the UP position. On the right is a closeup of the cut out area which shows where the emergency brake will attach to the side of the car's frame. Here, we see the fender lowered over the battery tray. The parts all fit together nicely so the battery tray can now be attached to the frame using the flathead bolts provided in the kit. The rear fender is off in this photo and the battery tray is clamped down to the frame. Drill material was left in the photo so the flat head bolt locations can be seen more clearly. Holes have been drilled down from the top of the tray to the frame. Then the exit holes were marked, then drilled up from the bottom. The flathead bolts go through the frame and are secured on the other side with 1/4-20 nylock nuts. The front of the fender is normally secured by the hinge. The rear of the fender will be secured by a knob in the rear that screws into the threaded hole in the shock-hump. Then, some neoprene (provided with the kit) will be placed onto the shock hump so the fender can rest on it. The neoprene is attached with hot glue. Pieces needed for fender knob. If you can find a low profile knob with a 1/4-20 thread, you can avoid this last step. Otherwise, here's how you can make a knob. The ACE lawnmower knob is female. We're going to make it male. Use a Dremil or hacksaw to to cut the nut that came with the knob out from bottom. Doing this should make a 3/8" nut fall out. Then, install a (1/4-20) 1 1/2" hex bolt and tighten to knob with a nylock nut. Attach and install the battery tray & fender- 1 hour. Add brackets to rear switch, then fit switch to fender - 1 hour. 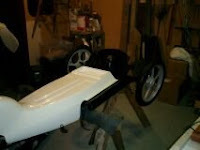 Cut out fiberglass to allow for battery mount points - 1/2 hour. Blogging about it 4 hours. 8-32 screws, nuts & lock washers instead of rivets. AWWWW Poor Pat , you do not mention him ..lol.. you just refer to him as an assistant!! If i don't bust your chops who will?? Looks good ! I can't wait to see it live! 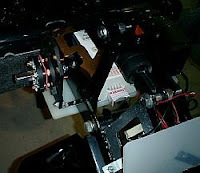 Installing an inexpensive seat slider.